Last year was an amazing year and 2012 is set to be an even more delicious one. 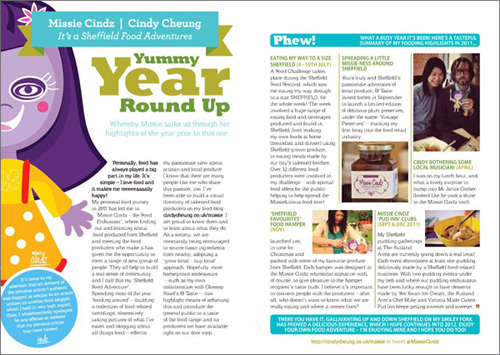 Pick up this month’s issue of Toast magazine to find my double-page foodie, illustrative piece about my tasty Food Adventures – gallivanting up and down Sheffield on my smiley fork. It’s proved a delicious experience, just read the article I wrote and gawp at photos (seen above) and you can find out how I ate my way through Sheffield! 2012 will be an amazing year personally and professionally, and I thank you for all your support along the way – The Missie Cindz has enjoyed her travels on her smiley fork. I like to think things happen for a reason, and when things feel tasteless and stale (i.e. hopeless), they usually, one way or another, come together. I guess life is far from perfect but then, who wants it to be? The one lesson I will take with me from 2011, is to have a change – do something new (after 4 years working in the same design agency, I went freelance and also changed jobs). After all, life can be too black & white enough. I believe 2012 will be a better and more colourful year – I’ll make sure it is. I do not have any New Year’s resolutions, but I have set myself a very modest food task, where I hope to try something edibley new each month and I will try to post the photographs of what I cook/eat and let you know how I get on here each month. I wish you all a very Happy New Year and I will leave you with a few of my favourite blog posts from 2011 – they’re all a Missie-licious read! January: My Breakfast Challenge begins! Toast is one of Sheffield’s lifestyle and culture magazines where they cover everything from food, fashion and music, you’d be able to find it in most independent shops in Sheffield city center. Magazines are free and if you have trouble finding a copy, just send me a tweet or email.